There is something that is essential when we are learning a new language and that is to practice. When we get to that point is when we remember the famous phrase that stands out saying: “practice makes the master”. It is necessary not to forget that languages must be learned, but they also have to be used regularly, because if not, we can forget them. Today we compile five tips that will help you learn French or, if you already speak it, to put it into practice in an easy and fun way. One of the things we most need to work on over time is the vocabulary. We may learn the basics of a language, but what’s really important is to be able to count on a wide range of words that allow us to express ourselves in a better way. 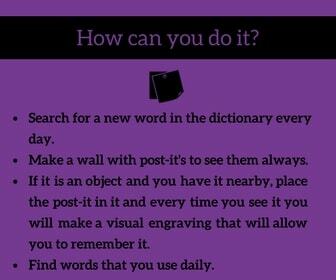 Therefore, it is a good idea to learn a new word every day, especially to look for vocabulary that we use regularly and that we associate with things of our daily life. It has been proved that the melodies of the songs can make your learning much faster. 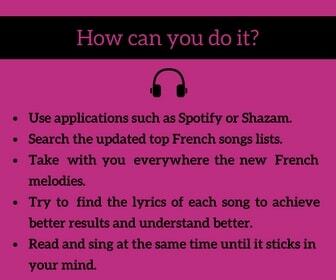 So, if you enjoy music, a good option is to learn a new song every week in French and that will allows you to listen and memorize. Whether you listen to modern songs or the most traditional ones, add to your play list the French melodies that will stick into your mind. One of the best ways to learn a language is is by reading. Not only because it enriches your vocabulary but also because it helps you understand how sentences are formed in the new language you study. 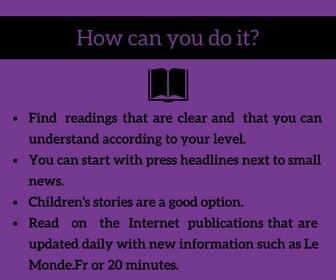 In addition, they say that whoever does not read does not write well, so you can imagine the importance of reading. 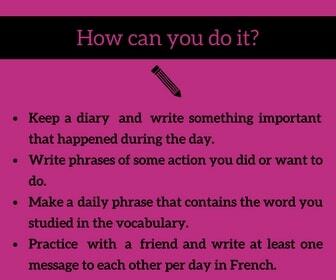 Whether you write something that happened to you during the day or that you find a friend with whom you can practice and speak in French, try to write a phrase every day that allows you to express something with full meaning. Writing will make you feel much more confident about your learning and you will be able to remember much better what you are learning. Learning nowadays becomes even easier. Now, many Internet sites or apps that allow you to practice any language at any time and in any place nowadays, and French does not escape from it. Therefore, if you are a technology lover, with the diversity of applications that exist to practice French, you will have no excuses for not learning one of the most beautiful languages in the world.